New for September 2009! This page was contributed by Tom Hogan from LEUS Networks, on a topic he is passionate about. We're not experts on MIMO (multiple input multiple output, a "smart" wireless technology), so we're extremely grateful Tom took the time to mentor us. Many thanks! From here down is Tom's writing. MIMO is a new term to describe the old concept of spatial multiplexing. Many young engineers today ebulliently regale us older folks with how MIMO shatters the Shannon Limit and how it will solve every problem in communications. Of these young engineers I ask one question: "When do you decide to turn MIMO off and concentrate all of your transmit power and receive resources to deliver a single stream of information instead?" Some engineers will answer a strident "never", while other engineers will think a bit and answer: "When the channel is line of sight, MIMO does not work so it needs to be turned off". Neither answer is correct and begets a historical tutorial on spatial multiplexing. Murphy's law tells us that in any ointment there will always be a fly. The fly in this ointment is that in order to double capacity, we not only split the information into two streams but we also doubled our transmit power. If our original transmitter was already operating at the regulatory limit, Big Brother is not going to permit us to double the transmit power even if we split the power between two polarizations or even two separate antennas. We are faced with having to send each of the two new streams at ½ the power of the original stream. To answer the question "When is this worth the bother?" we have to gauge the full benefit of all of the extra equipment if it was employed to maximum effect for the conveyance of a single stream of information. In this case we have two antennas at the transmitter and two at the receiver, and we can use the pair at the receiver in a phased array to gain 3 dB. At the transmit side we are still limited to a single antenna to stay within the ERP regulatory limit. The net effect is a 6 dB increase, 3 dB for antenna gain 3 dB for using the full transmit power in the single stream. 6 dB of course is a net increase of a factor of four. If the SNR of the original stream is better than 8:1 or 9 dB then it is worth splitting the signal into two streams each with an SNR of 4:1 or 6 dB. If the original SNR is worse than 9 dB then it is better to concentrate all of the transmit power and receive resources into a single stream. At this point in the tutorial, I usually have won over a few nodding heads, but there are frequently holdouts who want an example of "true" spatial multiplexing rather than polarization multiplexing. As coincidence would have it, spatial multiplexing without polarization multiplexing was also tried as a way to increase the capacity of microwave links. 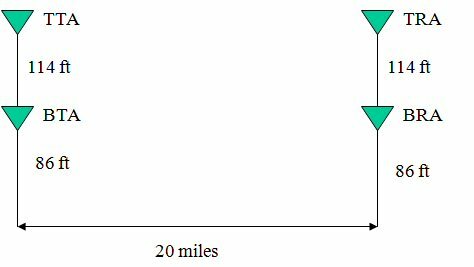 Let's take the example of a 4 GHz link with a separation of 20 miles between 200 foot towers. On top of each tower is a vertically polarized antenna. 114 ft down from the top of each tower is a second vertically polarized antenna. Analyzing this drawing using just the Pythagorean theorem will show that the path from the top transmit antenna (TTA) to the top receive antenna (TRA) is ¼ wavelength shorter than the path from TTA to the bottom receive antenna (BRA). Vice versa the path from the bottom transmit antenna (BTA) to the BRA is ¼ wavelength shorter than the path from BTA to the TRA . If we split the signal from each receive antennas into 2 paths, delay the signal from TRA by ¼ wavelength and sum with the signal from BRA, we null the signal from the BTA and maximize the signal from the TTA. Vice versa, if we delay the signal from BRA ¼ wavelength and sum with the signal from TRA, we null the signal from the TTA and maximize the signal from the BTA. The situation above is the quintessential optimal MIMO alignment where the antennas are fully decorrelated and the peak of the desired signal occurs at the exact same point as the null of the undesired signal. If an LNA is used at each receive antenna to take the losses from the splitter/combiners out of the noise figure calculations the only penalty from dividing the transmit power of a single stream into two streams is the 3 dB loss in transmit power itself. Though the benefit of splitting into two streams decrease with decreasing SNR, there is no SNR value where there is an advantage to using a single stream. Using only four two-way splitter/combiners and two ¼ wavelength pieces of coax, spatial multiplexing was achieved. The effect of this multiplexing was exactly the same as doubling the available bandwidth. At the time, it seemed like a license to print money -until the day it rained. When adding signals, nulls and peaks behave differently. In Figure 1 (above) we could reduce the separation between the antennas at both sides of the link from 114 feet to 57 feet, lengthen the coaxial delay cables to 3/8 wavelength each, still achieve a null and only suffer a 3 dB reduction in the amplitude of the desired signal. A deep null is another story altogether. A deep null requires precise amplitude and phase matching. A trombone line in the coax delay lines was needed to calibrate the phase and variable attenuators were needed to calibrate the gain differences in the antennas. Even a 1 dB mismatch between the antennas meant you were only able to null ¾ of the power of the cross talking stream leaving you with a SINR (signal to interference noise ratio) of 6 dB. To maintain a usefully deep null required matching on the order of 0.1 dB, which proved impossible with "set and forget" hardware when rain was dripping down the radome. A pilot tone and an automated trombone line and variable attenuator were needed to track and hold the null. At the time of this testing, the lust for capacity was driven by the need to convey video over these microwave links. FM transmission of video required at best slightly over twice the bandwidth of AM-VSB (amplitude modulation, vestigial side band) and in practice more like four times the bandwidth. If the goal was to maximize the available spectrum, part of the requirement was to transmit AM-VSB video over these links to conserve bandwidth and employ spatial multiplexing as well. Murphy again made his existence known when a funny thing was observed even when the nulls were perfectly calibrated. Calibration was done with just the interfering transmitter active sending just a CW signal and the trombone line and attenuator were adjusted to achieve a deep null. When unique TV signals were sent on both transmitters, what you saw on each picture tube was black lines at the beginning and end of the sync pulses from the interfering video stream sweeping across the picture of the stream you wanted to maximize. The appearance of the crosstalk was similar to what you might have seen up to a few months ago on a cable system where a strong local analog TV station shared the same channel and the cable shield was imperfect. When you turned off one of the transmitters and looked at the nulled station all by itself, the signal on the oscilloscope looked like a differentiated video signal. Every fast powerful transition from light to dark and vise versa looked like a ringing sawtooth. There was no setting of the trombone line or the attenuators that would null this ringing out. After some experimentation, it was determined that the ringing was due to multipath from the ground clutter between the links. Whenever the transmitter made a step change, this resulted in a chaotic change in amplitude and phase as all of the old multipath rays died out and were replaced by rays at the new amplitude. As each new multipath ray arrived, the nulling trombone line and attenuator would need to be adjusted to a new null. It was hopelessly complex to equalize the null quickly and accurately enough to maintain the null while the signal was changing. The ideal modulation format would have been a digital one with a slow symbol rate and a guard interval at the boundary between symbols where the receiver would simply ignore what was being received until all of the multipath chaos settled out. Such a modulation scheme, namely DMT (discrete multi-tone), or more bombastically, OFDM (orthogonal frequency-division multiplexing), was decades in the future so spatial multiplexing just sat on the shelf gathering dust with the other white elephants until it was recently rediscovered. NOTE 1: In practice, polarization multiplexing often used circular polarization in microwave links to eliminate odd order multipath. This fact is omitted from the tutorial for clarity. Polarization multiplexing is still employed today to maximize the spectrum available for "Turdbird" TV (a.k.a. Rupert Murdoch's satellite television company). At this point in the tutorial, some of the engineers who are able to think without a computer realize that MIMO is just the summation of two vectors with the phase and amplitude optimized to null out one of the streams. Some engineers at this point apparently uncomfortable that the emperor is sporting perhaps only a fig leaf, want to know what all this 50 year old work has to do with modern OFDM systems operating in a non line of sight channel. As mentioned at the end of the previous part of this tutorial, the ideal modulation format for spatial multiplexing is DMT (OFDM by any other name). DMT uses a guard interval so that the receiver can ignore the transitions between symbols when multipath rays from the old symbol are being replaced with multipath rays from the new symbol. During this chaotic changeover time between symbols, the DMT receiver is simply ignoring what is happening. At the end of the guard interval, the receiver evaluates the signal using a FFT (fast Fourier transform) and converts each tone (sub-carrier) into a vector representing amplitude and phase. Each subcarrier, taken on its own, looks just like the signal from one of the receive antennas in Figure 1 of the first part of the tutorial. If the modern receiver has 2 antennas and 2 receive chains then each receive chain outputs a vector for each subcarrier. Instead of using trombone lines and attenuators as was done in prehistoric times, the modern receiver simply phase shifts and amplitude scales the vectors in DSP (digital signal processing) to achieve the desired null. The steps we use to train a modern system for MIMO may make this clearer: training is performed on each subcarrier taken as an individual. Figure 2 above shows transmit antenna A and transmit antenna B as well as receive antenna 1 and receive antenna 2. Transmit antennas A and B are located on the same tower and receive antennas 1 and 2 are located on the same handheld. Step 1. Turn on transmitter A, wait until the end of the guard interval and observe the amplitude and phase of stream A received on antennas 1 and 2. Step 2. Choose the receive antenna where signal A is the quietest and subtract from this an attenuated and phase shifted signal from the louder antenna adjusted to cancel signal A. This subtraction will yield stream B. Step 3. Turn off transmitter A and turn on transmitter B, wait until the end of the guard interval observe the amplitude and phase of stream B received on antennas 1 and 2. Step 4. Choose the receive antenna where signal B is the quietest and subtract from this an attenuated and phase shifted signal from the louder antenna adjusted to cancel signal B. This subtraction will yield stream A. From the training description, it should be apparent that as opposed to the line of sight example from pre-history, in a rich multipath environment there may be an amplitude difference between the streams as seen at the receive antennas. It should also be noted that unlike maximum ratio combining there is no telling what the phase of the vectors of the desired signal will be as this phase shift before the subtraction is dictated by the requirements of the null. Sometimes the summation will be beneficial other times it will be detrimental. As for when it is beneficial and when it is not, during any training period is it possible for the receiver to determine whether it is advantageous to use MIMO or whether it is better to use all of the transmit power and receive resources to convey a single stream. As for how often the choice swings towards MIMO, there are many papers written on this subject. The trends revealed in these papers are that when the antennas at each end of the link have greater separation, this is beneficial to MIMO. When the transmitter and the receiver are closer together, this is beneficial to MIMO. When the multipath arrives from a wide range of angles, this is beneficial to MIMO. So far we have discussed the most common form of MIMO, where the processing to create the null is performed at the receiver. It is also possible to do exactly the same thing at the transmitter. Going back to Figure 1 in the first part of this tutorial, it is possible to put the ¼ wave delay lines and the trombone lines at the transmitter side of the link. An observer at the receive end of the link could simply radio back (by walkie-talkie) instructions to a colleague at the transmit end to adjust the trombone lines and attenuators to null the signal in such a way that stream 1 would appear on the top receive antenna (TRA) and stream 2 would appear on the bottom receive antenna (BRA). This sort of MIMO processing at the transmitter has been dubbed SDMA (spatial division multi-access) in the modern world. Step 1. Turn on transmitter A, wait until the end of the guard interval and observe the amplitude and phase of stream A received on the antennas of both handheld 1 and 2. Step 2. Turn off transmitter A and turn on transmitter B, wait until the end of the guard interval and observe the amplitude and phase of stream B received on the antennas of both handheld 1 and 2. Step 4. Transmitter A chooses the receiver it delivers the strongest signal to. Transmitter B chooses the receiver it delivers the strongest signal to. Step 5. Transmitter A sends the message intended for its chosen receiver and adds to it a little of the message transmitter B is going to send to the other receive. Transmitter A adjusts the amplitude and phase of transmitter B's message to just cancel what would be received as interference on its chosen receiver from Transmitter B. Step 6. Transmitter B sends the message intended for its chosen receiver and adds to it a little of the message transmitter A is going to send to its chosen receiver. Transmitter B adjusts the amplitude and phase of transmitter A's message to just cancel what would be received as interference on its chosen receiver from Transmitter A. Using a training sequence like this the channel state information is conveyed to the transmitters. This information not only can be used for MIMO processing it can also be used to choose the optimal subcarriers to communicate with a particular receiver. It could even be used to decide how much information each subcarrier can convey and pack more information into some subcarriers than others. If we were deploying wireless networks on the dark side of the moon where nothing moves there would very little more to say about MIMO. Unfortunately here on earth, things move. The worst case is when the mobile station itself moves. A car is traveling from point A towards point B at 60 miles per hour. Transmitters are located at point A and point B and have established a null over the car. Transmitter A is sending a 1000 byte packet at 8 Mbps. The packet takes 1 ms from start to finish to send. During the 1 ms packet duration the car moves about an inch. At 1 GHz, the wavelength is 1 foot and in the example above, the distance between a null and a peak in the radiation pattern is about 3 inches. The movement of an inch takes us out of the null and 1/3 of the way towards the peak. Remember that the peak is twice as loud as the original interference because we are actively transmitting a cancellation signal. A rotation of 1/3 of the way from null to peak is the point where the sum of the original interference and the cancellation signal is the same amplitude as if we had done no cancellation at all. The channel state information we learned during the training period at the beginning of the packet is hopelessly stale by the end of the packet. The rate at which the training information gets stale increases linearly with increasing carrier frequency, if we had chosen 3 GHz as the carrier frequency in this example the motion of the car would have taken us all the way from the null at the start of the packet to the peak by the end of the packet. To mitigate this staleness problem we use a series of educated guesses, generally referred to as channel estimation. The first educated guess is that during the training period, we evaluate the Doppler shift of the incoming signals. From the Doppler shift we can get a sense of the speed and direction of the mobile station. This information can be used to predict what the channel will do next so long as there is no accelerating, decelerating or change of direction of the mobile station. Pilot subcarriers are also used for channel estimation. Pilot subcarriers convey no end data but instead convey a sequence of predetermined data known to the receiver. By observing how the pilot tones change in amplitude and phase from their expected values it is possible to calculate a correction factor between their observed amplitude and phase and their expected values. By applying this same correction factor to subcarriers in nearby spectrum, it is possible to compensate for changes in the channel as things physically move. This compensation is never exact and the approximation gets worse the farther in frequency the compensated subcarrier is from the pilot subcarrier. Also, when the MIMO processing is done at the transmitter this channel estimation information must be transferred from the receiver to the transmitter and this transfer must be as timely as possible. Even with accurate training and the best channel estimation possible there is a performance overhead to performing all of the communication needed for this compensation and this overhead increases directly with the speed at which the channel is changing which itself increases linearly with increasing carrier frequency. Even with every optimization, there will be a carrier frequency/speed of channel change above which MIMO, particularly MIMO processed at the transmitter, where the overhead becomes excessive. No discussion of history is complete without a respectful attempt to conceive of what will occur next. Just as the lust for capacity was driven by the need to convey video 50 years ago, the same is true today. 4G business plans assume that customers will be able to enjoy the same YouTube experience connected to the 4G public networks as they have at home connected to their private WiFi network. To gauge the magnitude of this challenge, consider that MediaFlo , transmitting an eye popping 50,000 watts of ERP, using 5 MHz of spectrum in the vaunted 700 MHz band is only able to deliver 20 unique streams of video. Consider too that in a big city, like New York, the population density can be upwards of 40,000 people per square mile. Couple these two realities and it becomes conceivable that WiMax and LTE may swell the list of technology disappointments including G.lite, HomePNA 1.0. Broadband over Powerlines, WiMedia and Metro WiFi. Success for 4G lies not just in optimizing technology but more importantly in understanding how the customers will use the service. In large cities, most of the customers are not in the streets and most of those who are have their visual centers otherwise engaged and will not be downloading video. The customers for video services are inside of the buildings and stationary for the most part. Using the working intuitive understanding of MIMO developed in the first two sections of the tutorial and realizing that MIMO is simply the summation of vectors with the amplitude and phase adjusted to null out interfering streams, we can imagine the technology needed to serve this market. Consider the classic three sector cellular reuse pattern shown in Figure 5 below. The available spectrum is broken up into three equal sized chunks: orange, blue and green. Imagine an indoor low power base station or Picocell by any other name, located at the center of one of the orange hexagons. It does not take an excess of creativity to appreciate that this Picocell can operate on the blue and green spectrum so long as it employs low enough power to not interfere. A much more magical solution can be imagined when considering how this Picocell can optimize the orange spectrum. So long as the Picocell shares a reasonably accurate common notion of time with the tower and has a high bandwidth backhaul so that it has a copy of the packet the tower intends to send, the Picocell can send the same packet as the tower, time aligned so that the guard intervals are reasonable well overlapped. In this way Picocells can augment the coverage of the towers without interference. To a receiver, the same packet sent from multiple transmitters simply appears as a packet sent from a single source that has strong multipath component. Picocells located anywhere within the coverage hexagon can work together to reinforce the signal from the towers. This augmentation is not MIMO per-se but rather an additional exploitation of the OFDM guard interval. Within any building there will likely be multiple (perhaps many) Picocells. For Picocells located in the red hexagon away from the coverage fringe, the green and blue spectrum can be reused at low power. If all of the Picocells are coordinated, MU-MIMO can be used to share this spectrum without interference. MU-MIMO is more suited to indoor channels than outdoor ones because people move slower than cars Since the rate of change in channel characteristics is directly proportional to the speed of the objects moving around within the channel and also to the carrier frequency, operation around 700 MHz has clear advantages compared to operating in higher frequencies bands. In most cases, the channel state learned during the training interval will remain adequately fresh throughout the packet to obviate the need to send updates to the transmitter during the packet. If the building containing the Picocell is located towards the coverage fringe where adjacent cell site's coverage patterns overlap, the Picocell is able to reinforce the coverage from multiple towers but not reuse the frequencies to convey independent data. Fortunately, only a small area exists where there is fringe overlap of all three chunks of spectrum. Hopefully, through our understanding of the history of spatial multiplexing we can more clearly appreciate how the various flavors of MIMO can contribute to success in wireless networking. Where the first commercial deployments of MIMO in WLANs involved MIMO processed at the receiver, the variations of MIMO where the processing occurs at the transmitter show great potential to permit 4G networks to deliver a service that lives up to customers' expectations. Should any questions arise from the reading of this article please contact me. I am always happy to discuss the history, the possibilities and the limitations of MIMO.